You can never seem to find something to wear yet your wardrobe is bursting with clothes, threatening to spill itself into a floordrobe. So I'm sitting here on my bed actually living that exact scenario out. I know it's a drag. It can seriously feel like a mammoth task, which is probably why I have put it off so much but today's the day I've decided to tackle it head on. 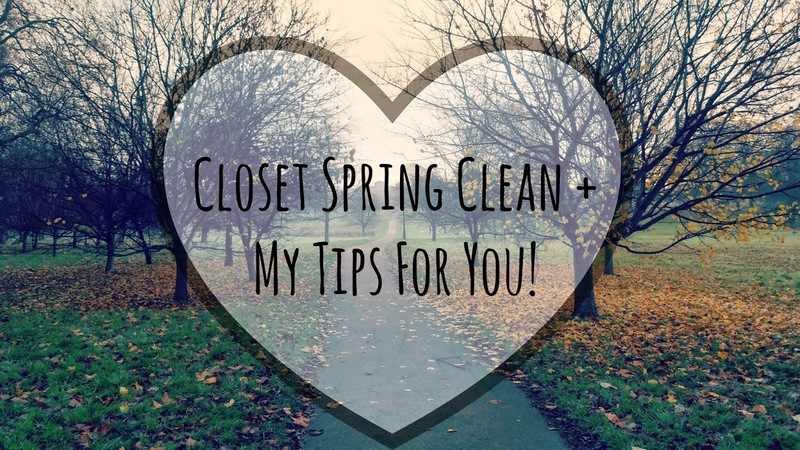 Since I figured that I'm probably not the only one suffering with a bout of 'IHaveNothingToWearButIHaveAFullWardrobe- itis' I thought I might share with you some of my tips and tricks when it comes to that Spring clean. Firstly, I like to implement some kind of organisational system before I start pulling clothes out left, right and centre. I grab a few different plastic tubs and mark them as 'Rubbish', 'Donate' and 'Seasonal'. Now if you come across any clothes that might be dirty with that stubborn stain that no amount of washing could get out or un-repairable holes, it goes in the 'Rubbish'. Clothes that go in the 'Donate' pile are ones that maybe have had their day in your wardrobe and you really can't think of any outfits you can create with them even though they're still in relatively good condition. Say your goodbyes and send them onwards to a better home where someone else might appreciate them. DO NOT send dirty, marked and creased clothing for donation as these will just get thrown out. As someone who used to work in a charity shop, they just hate it when you send rubbish. If you really want to donate, supply them with re-usable, good quality clothes please. Or honestly, just put them in the bin yourself. As far as 'Seasonal' goes, it's pretty self explanatory. Since Summer is rolling around, for me this would mean big, thick Winter coats, hats and scarves would go in so I could fill up my closet with pretty Summery dresses! If you have not worn the item in the last year, toss it. Don't try and hold onto clothes that don't fit you quite right either. You don't need extra clothes that you can't even wear hogging your wardrobe. The best thing about getting rid of all your clothes is that you can replace them! If you're on a tight budget you can sell some of you donation pieces online to earn some coin to replace items you might be missing. I find that ASOS Marketplace is a fantastic place to sell some of your clothes that you might want to move on from while still making some moolah. If selling is not your thing you can organise a clothes swap party with a few of your friends! You can all organise to bring 5 or so pieces each to the swap, have a little movie montage fashion show and then leave with totally new items. I think this one's a win for everyone involved because it is socialising and shopping from the comfort of your own home. Plus, you might be able to snag that awesome jacket you've been eyeing on a friend! If you've got a pair of jeans that fit well but might be too long or a couple of buttons missing from a blazer that is your going out staple, the easiest thing to do here is to tailor and repair! Now that you have sorted, culled and tailored everything you're going to keep, you can now assess what you really need to make your wardrobe complete. For me, I always find that I lack a lot of basics in my wardrobe however, you might find that you need a black maxi skirt or a cute pair of boyfriend jeans to complete your wardrobe. My tip is to only buy what you really need. You have your 'Keep' pile sorted and new clothes to accompany them, now all you need to top it off is to reorganise your wardrobe. Whether you choose to colour coordinate, buy some luxurious wooden hangers or even a tie/ scarf/ shoe organiser, just make sure you establish your wardrobe the way you want it. Well that's all I have for today! I might end up writing a second part to this post in the future if I come up with any other tips. Do you have any organisation tips for me? Let me know in the comments below!